For those of you who don't already know, Evie has an augmentative communication device called a NOVA Chat. While Evie's oral motor skills are getting stronger, she still is not able to express herself verbally, and needs a way to communicate, especially in the school setting with people who do not know her sign language motions. 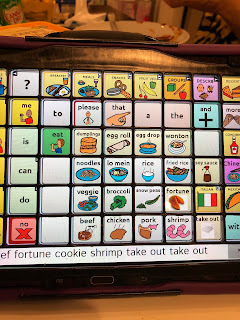 When we were first presented with our options at Boston Children's Hospital in the augmentative communication clinic, we had to decide between the iPad and the NOVA Chat. We chose the NOVA chat because Evie is already way too attached to the iPad and we want her to see the NOVA Chat as a communication device and not a potential Youtube playing device. But the iPad is a perfectly good choice for other kids! Evie's preschool team has fully embraced the NOVA Chat. We attended a half day training with a Saltillo rep, which was helpful, but the training was oriented more towards the therapist than the parents. The NOVA Chat has a home page built of various core words that trigger other menus of related words. For instance, if Evie wants to say "Want eat breakfast," she can hit want--> eat --> breakfast. When she taps "eat," another page of food options pops up. She loves naming fruits and vegetables. Her favorite is "Chinese cabbage." 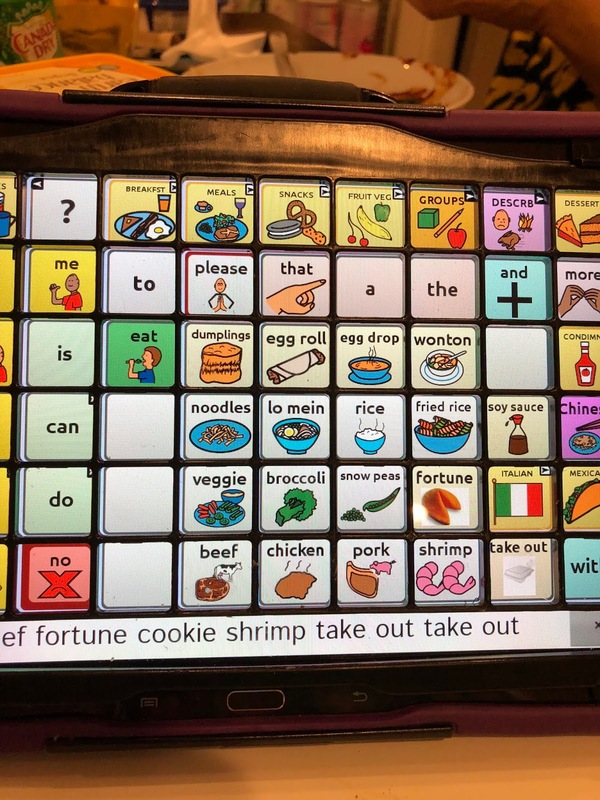 As you can see below, if you click on the Chinese food square, you could potentially order Chinese food on the NOVA Chat! Lots of Chinese food options on the NOVA Chat! I'd like egg drop soup, please! In all seriousness, life with a NOVA Chat takes some adjustment. We are supposed to have the device accessible to Evie at all times, but I will admit that we don't always have it there, because we know all of her signs, and she expresses herself to us with sign language. 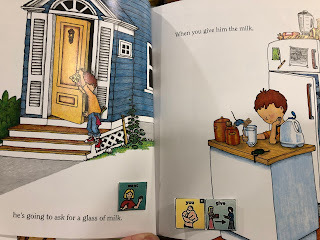 However, we have it at the meal table and when we are starting a new activity so that Evie can tell us if she wants to do something else. She is VERY good at saying "watch iPad." 1. 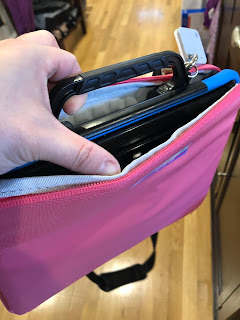 A carrying case and a keyguard: I got this case on Amazon for our NOVA Chat 10. We originally started with NOVA Chat 8, which is smaller, but Evie had a lot of trouble with accuracy in tapping the squares. So our trial changed to a NOVA Chat 10 with a 60-location keyboard. We liked the 60-location setting much better than the 30-location because we didn't have to change pages as often when trying to say something. 2. Name labels: I am terrified of losing this device, since the insurance is paying for it. The first order of business was to use our NameBubbles tags on the device and the case so that her name is on them. I use these same labels on her bottles and wheelchair and backpack. 3. Tile locator: Tiles were on sale for the holidays, so I thought I'd try them out. I am in love. I have already used the locator to find my phone several times. All you have to do is download the app, press some buttons to make the phone talk with the tile, and you are ready to lose things! 4. NOVA Chat strap: I would say that this strap has been annoying and helpful at the same time. I would still recommend using it for school use, because when your hands are full with a walker, backpack, and a 28-pound 4 year old, a strap is very useful. 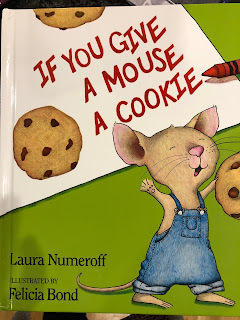 This book is coming up in Feb in the preschool curriculum, and Evie will be ready! 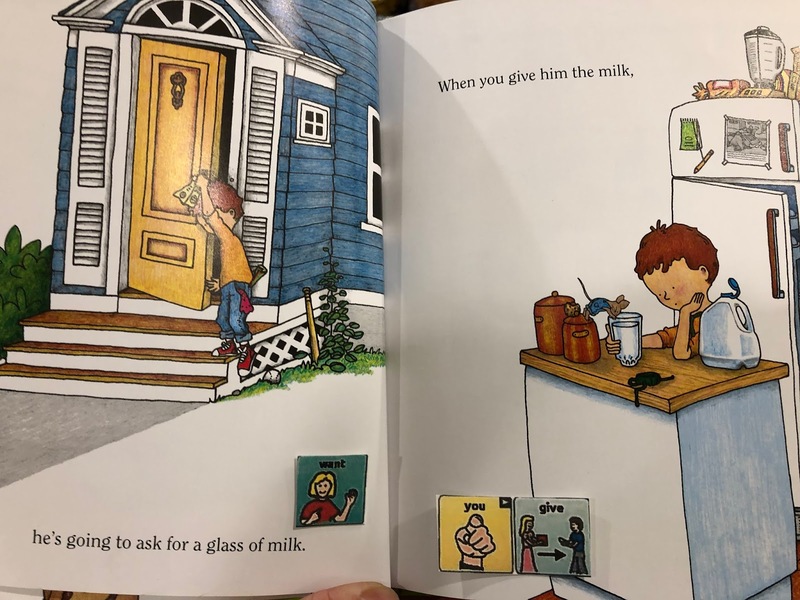 An example of how we stuck the picture cards in her book. 6. Household activities: The trainer and speech therapist also encouraged us to print common daily activities and stick them around the house. 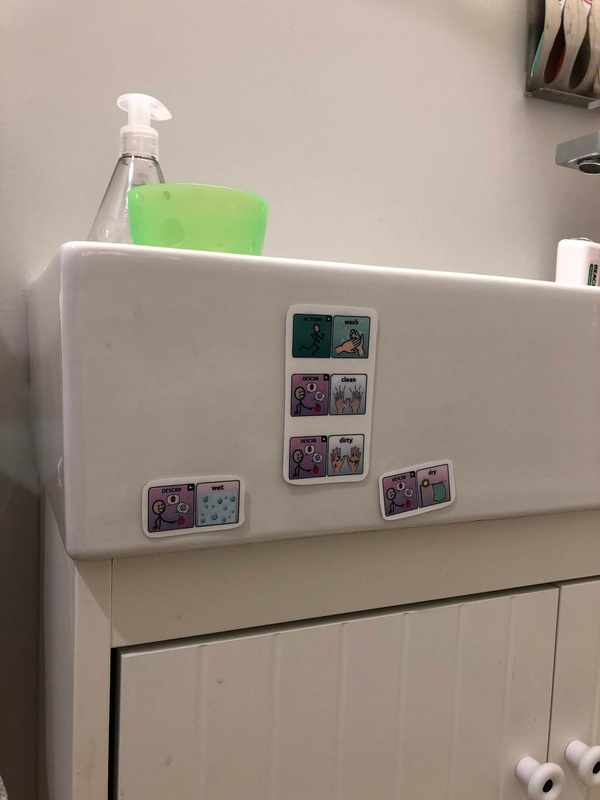 Here's a pic of what is in the bathroom for Evie. These pictures show how to say clean, dirty, wet, wash, and dry. Evie is pretty good about getting up on her IKEA stool and turning on the faucet by herself, rubbing her hands together once she has soap, rinsing, turning off the water, and then knows how to dry her hands while she leans against my legs. I've been slightly stepping back to see if she notices that she can stand on her own. So far, I've had a 50/50 success rate with that. Those are our NOVA Chat hacks! I'd love to hear other people's hacks too! 1. Referral from BCH Augmentative Communication SLP (speech therapist). 2. Fill out a gazillion forms for Saltillo and the funding company, PRC (forms provided by the therapist at the hospital). 3. Wait for PRC to let us know that insurance has cleared the rental. 4. Training scheduled with the school team and parents. 5. Start trial period, adjust to taking NOVA Chat everywhere. Record instances of how Evie is using the device over the next month (just doing a few days here and there over a progression seems to be ok). 6. Follow up visit with SLP at the hospital to document progress. 6. At end of trial period, SLP writes a report from hospital and speech therapist from school writes report. Parents provide the usage log. This goes to the funding company (PRC) and then is cleared with Saltillo (or whatever company you use) and we get to keep the device! Some notes about our experience...we started with a NOVA Chat 8 and no key guard, as well as a 30-location setup (i.e. 30 words on the screen at a time). Evie's had trouble finding the very small words, and her fingers kept slipping down to the word below her target. So we switched to a NOVA Chat 10 and a 60-location key guard during her trial, and this worked much better (although is a bit harder to carry around everywhere). I hope this helps someone in their journey, as it was a bit confusing at first. Happy Talking!